This is so popular here I need a quick graphic to represent the multitude of considerations and potential pitfalls. However, video is not directly analogous to face to face interaction. 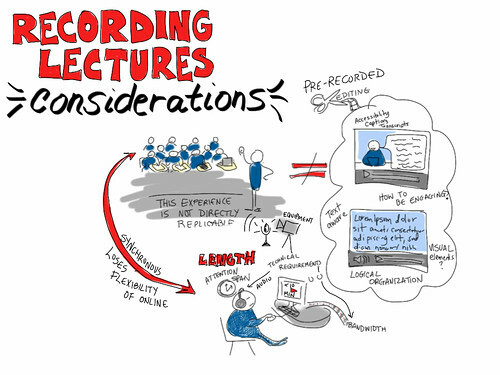 You cannot simply record your in-class lecture and expect your learners to have the same experience as those in the room with you. Passively watching videos is not the same as sitting in a lecture. The energy of being in the presence of other classmates and a teacher is not directly replicable on video. This is a university class; your students can read. What advantage does your voice have over the content? Is there are a graph, image, metaphor or diagram that would benefit from your verbal explanation? You must consider whether reading PowerPoint slides would be more appropriate as text alone. Apart from the pedagogical considerations, there are technical limitations. Use of video raise equity issues regarding access. Bandwidth, computer equipment varies even still in Canada. Some remote communities in Northern Ontario are completely unable to view video online. We cannot predict how access to the Internet or devices may vary around the world. CPI has procured a video streaming server for distribution that will scale the video quality proportionate to the bandwidth available and only send the learner the segments they request. Of course, this great feature comes at a cost and there are financial implications for use of this server. 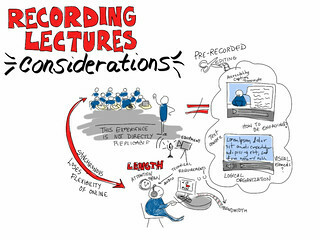 Will you use pre-recorded videos? With the rise of Khan Academy, pre-recorded instructional videos have become more popular than ever. Lecturing over slides is very familiar for many faculty. For those courses supported by the elearn intitiative, CPI provides screen-capturing software licences, e.g. SnagIt and microphones and captioning/transcription. Do you have DVD/materials that require copyright permission in order to use in your online course? We have a campus license of Ellluminate available if this is necessary. Sometimes it is. For example there are particular classes where culturally specific practice is based on narrative interpersonal relationships. When learners are in remote communities, synchronous conferencing allows a teaching and learning conversation to unfold in real time respectful of those cultural preferences. Unfortunately, as mentioned, many remote communities also have extremely limited bandwidth. Additional technical support for Java, audio and video pose challenges to using this service, In these cases, use of central ITS' teleconferencing systems may be more appropriate. It's worth noting that while some learners appreciate the opportunity to connect live with an instructor, required attendance to classes at particular dates and times remove the flexibility built into online learning.